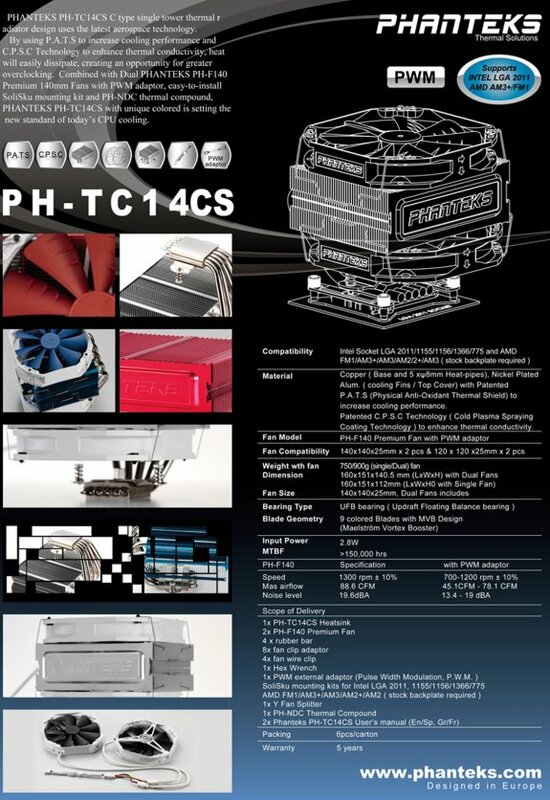 European cooling expert Phanteks expands its product portfolio with the PH-TC14CS C-Type CPU Cooler. The PH-TC14CS measures 160 x 151 x 140.5 mm ( with dual fans), it weighs 900 grams, has five nickel-plated 8mm copper heat-pipes, and supports the latest LGA 2011/ 1155/ 1156/ 1366/ 775 and AMD FM1/ AM3+/ AM3/ AM2/ 2+/ AM3 micro-processors. Featuring Phanteks patented Physical Antioxidant Thermal Shield ( P.A.T.S) and Cold Plasma Spraying Coating Technology (C.P.S.C), PH-TC14CS provides a perfect cooling solution for low profile setups. Enthusiasts with HTPC’s or multimedia cases can achieve maximum cooling while maintaining quiet performance. The PH-TC14CS will be released with the following four colors; standard color and /Blue/Red/BLACK Edition. Phanteks includes a PWM external adaptor for an even more quiet cooling performance. Now available at most local retailers with the standard Phanteks, PH-TC14CS at $74.99 and Blue/Red/Black edition at $79.99.